The following is a directory of the products and services that we offer at EMI Specialty Papers. If you are unable to find what you are looking for, please give us a call at 800-456-7273. We are experts at finding custom solutions in the specialty paper industry. Certified manufacturer & converter of specialty papers, boards & tissues: blotting stock, filter materials, cotton blends, in sheets, rolls, die cut, printed, perforated. Discs, pads, wicking materials, pulp test blotter paper, air freshener paper specialists. Certified manufacturer & converter of specialty papers & boards designed for the air freshener and aromatherapy industry of controlled release materials for home, auto, janitorial & industrial uses, compatible with many fragrances & inks, Die cut into pads, slit, sheeted, printed. Wicking materials available. Certified manufacturer & converter of specialty papers, boards & tissues: blotting stock, filter materials, cotton blends, insheets, rolls, die cut, printed, perforated. Discs, pads, wicking materials, pulp test blotting paper, air freshener paper specialists. Heavy non-silicone release paper for rubber manufacturers. Polypropylene coated paper. Custom die cutting, kiss cutting of coated, uncoated, saturated, impregnated papers, paperboards & non-wovens from rolls/sheets. Sheeting, slitting (wide & narrow roll specialists) perforating, printing. Hundreds of materials available. Certified manufacturer & converter of vulcanized fibre, fishpaper & board in different thicknesses for electrical insulation. UL, MIL, ASTM. Die cutting, adhesive laminating, slitting & sheeting. Certified manufacturer & converter of vulcanized fibre, fish paper, forbon, dielectric papers, Mylar & other specialty paper & paperboard, impregnated, laminated, saturated, coated, printed, perforated, rolls, sheets. Custom die cutting, slitting, (wide & narrow roll specialists), kiss cutting, adhesive laminating, pressure sensitive for batteries & other industrial uses. Certified manufacturer & converter of perforated, die cut, printed paper & paperboard for industrial uses, filter outerwraps & shells. Rolls & sheets with overall perforations or for tearing. Certified manufacturer & converter of specialty paper & paperboard latex & melamine impregnated, saturated, coated, die cut, slit (wide & narrow roll specialists), sheeted. Certified manufacturer & converter of specialty paper & paperboard, film & foil, laminated, saturated, coated, printed, perforated, rolls, sheets. Custom die cut, slitting (wide & narrow specialists). Adhesive laminating, pressure sensitive label stock, kiss cutting. Certified manufacturer & converter of specialty papers & boards designed for the air freshener and aromatherapy industry of controlled release materials forhome, auto, janitorial & industrial uses, compatible with many fragrances & inks, Die cut into pads, slit, sheeted, printed. Wicking materials available. Certified manufacturer & converter of specialty papers & boards designed for the air freshener and aromatherapy industry of controlled release materials for home, auto, janitorial & industrial uses, compatible with many fragrances & inks, die cut into pads, slit, sheeted, printed.Wicking materials available. Certified manufacturer & converter of manila, chip, paper & paperboard, impregnated, laminated, saturated & coated (poly, custom), fish paper & vulcanized fibre, insulating paper & board, die cut, printed, perforated, rolls, sheets. Certified manufacturer & converter of paper & boards coated with polyethylene, polypropylene, polyester, acrylic, pyroxylin, clay, wax, silicone & non-silicone release papers. Heat seal, water, oil, fire resistant, reinforced papers & boards. Custom die cut, slitting (wide & narrow roll specialists) sheeting, printing, perforating. Certified manufacturer & converter of manila & tag boards. Manila, index, other bristols & (wide & narrow roll specialists), specialty papers & boards slit, die cut, perforated & sheeted, adhesives applied, printing, coating, laminating, reinforced, wet strength & pressure sensitive papers. Certified manufacturer & converter of oiled stencil board. Certified manufacturer & converter of circles of bond, filter grades, hundreds of specialty papers & boards.Printing available. Certified manufacturer & converter of circles of bond, filter grades, hundreds of specialty papers & boards. Printing available. 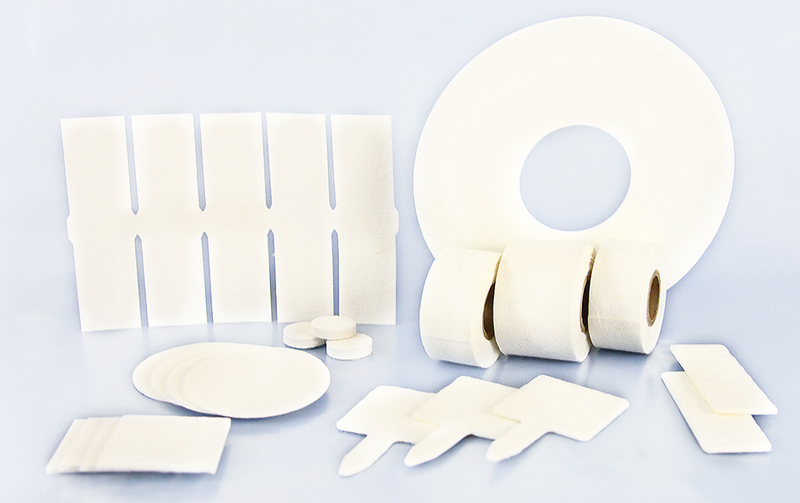 Certified manufacturer & converter of heavy non-silicone release paper. Polypropylene coated paper custom die cutting, slitting. Certified manufacturer & converter of paper & boards coated with polyethylene, polypropylene, polyester, acrylic, pyroxylin, clay, wax, silicone & non-silicone release papers. Heat seal, water oil, fire resistant, reinforced papers & boards. Custom die cutting, slitting (wide & narrow roll specialists) sheeting, printing, perforating. Custom die cutting, kiss cutting of coated, uncoated, saturated, impregnated papers, paperboards & non-wovens from rolls/sheets. Sheeting, slitting (wide & narrow roll specialists), perforating. Hundreds of materials available. Certified manufacturer & converter of specialty papers & boards designed for the air freshener industry of controlled release materials for home, auto, janitorial & industrial uses, compatible with many fragrances & inks, die cut into pads, slit, sheeted, printed. Wicking materials available. Custom die cutting, perforating, printing, slitting (wide & narrow roll specialists), traverse winding, sheeting (close tolerance), laminating, coating (poly, release, custom) on many papers, paperboards, films, non-wovens & interleaving materials in stock. Rotary & progressive die cutting, slitting, sheeting, perforating & kiss cutting. High quality wicking and blotting papers for Lab work: Diagnostic grade cotton and cellulose blend materials, comparable to Whatman, GE, Schleicher & Schuell, die cut and custom packaged. Certified manufacturer & converter of vulcanized fibre, fish paper, forbon, dielectric papers, Mylar & other specialty paper & paperboard, impregnated, laminated, saturated, coated, printed, perforated, rolls, sheets. Custom die cutting, slitting, (wide & narrow roll specialists), kiss cutting, adhesive laminating. For batteries & other industrial uses. Certified manufacturer & converter of discs, circles, rings; die cut, paper, paperboard tissue,non-wovens, filters. Certified manufacturer & converter of discs, circles, rings; die cut, perforated, filtration paper, paperboard tissue, non-wovens. Certified manufacturer & converter of discs, circles, rings; die cut, paper, paperboard tissue, non-wovens, filters. Manufacturers of perforated paper filter outerwraps, filter shells, filter covers, filter jackets and element bodies for oil, air and fuel filters. Printing available with interlocking tabs or slots. Manufacturer & converter of specialty papers & boards designed for the air freshener industry of controlled release materials for home, auto, janitorial & industrial uses, compatible with many fragrances & inks, Die cut into pads, slit, sheeted, printed. Wicking materials available. For difficult packaging or custom assembly jobs, start-ups, bundling or specialized packing, like rubber banding, tying or sleeve packing. Manufacturer & converter of paper, paperboard & fibre inserts. Liners. Certified manufacturer & converter specialty of paper & paperboard, film & foil, laminated, saturated, coated, printed, perforated rolls, sheets. Custom die cutting, slitting (wide & narrow roll specialists). Adhesive laminating, pressure sensitive label stock, kiss cutting. Certified manufacturer & converter of easy and tight release silicone & non-silicone papers, quilon, polycoated papers in many weights. Rolls, sheets in many stocked sizes. Custom die cutting, slitting (wide & narrow roll specialists) traverse winding, sheeting, tight & quick release, differential coatings. Certified manufacturer & converter of tubes & cores, printed or plain. Spiral wound. Certified manufacturer & converter of specialty paper, paperboard & tissue impregnated, laminated, saturated, coated, die cut, printed, perforated, reinforced slit (wide & narrow roll specialists), sheeted, interleaving, electrical grades, neutral pH, sulphur-free, fish paper, non-wovens. Custom die cutting, kiss cutting of coated (poly, custom), saturated, impregnated papers, paperboards & non-wovens from rolls/sheets. Sheeting. slitting (wide & narrow roll specialists), perforating, printing. Hundreds of materials available. Certified manufacturer & converter of acid, solvent & oil resistant papers & boards, coated, impregnated barriers, reinforced, ant-corrosive materials in rolls, sheets or die cut. Certified manufacturer & converter of pH neutral, sulfur-free paper for metals, glass & archival uses, for packing, interleaving, plain & printed, shredded. Fine & industrial tissue, plain & printed. Certified manufacturer & converter of tissue paper & board. Neutral & high pH, acid free, low sulfur, buffered. Manufacturer & converter of glassine, pH neutral, low sulfur papers & boards. Manufacturer & converter of manila, chip, paper & paperboard, impregnated, laminated, saturated & coated (poly, custom), fish paper & vulcanized fibre, insulating paper & board, die cut, printed, perforated, rolls, sheets. Manufacturer & converter of specialty papers, boards & tissues: blotting stock, filter materials, cotton blends, in sheets, rolls, die cut, printed, perforated. Discs, pads, wicking materials, pulp test blotter paper, air freshener paper specialists. Manufacturer & converter of paper & boards coated with polyethylene, polypropylene, polyester, acrylic, pyroxylin, clay, wax, silicone & non-silicone release papers. Heat seal, water oil, fire resistant, reinforced papers & boards. Custom die cutting, slitting (wide & narrow roll specialists) sheeting, printing, perforating. Manufacturer & converter of manila & tag boards. Manila, index, other bristols & (wide & narrow roll specialists), specialty papers & boards slit, die cut, perforated & sheeted, adhesives applied, printing, coating, laminating, reinforced, wet strength & pressure sensitive papers. Manufacturer & converter of moisture resistant paper & boards: poly coated, latex & melamine inpregnated reinforced waterproof industrial papers & non wovens, non staining & asphaltic materials. Custom die cut, slit (wide & narrow roll specialists), sheeted. Manufacturer & converter of neutral pH, dielectric, fish, vulcanized fibre, poly & heat seal coated, waxed, wet strength, extensible, creped, virgin & recycled. Die cut, slit (narrow & wide roll specialists) sheeted, perforated & printed. Manufacturer & converter of die wiping papers. Manufacturer & converter of two-sided paper board, different colors. Manufacturer & converter of vulcanized fibre, fish paper, forbon, dielectric papers, Mylar & other specialty paper & paperboard, impregnated, laminated, saturated, coated, printed, perforated, rolls, sheets. Custom die cutting, slitting, (wide & narrow roll specialists), kiss cutting, adhesive laminating, pressure sensitive for batteries & other industrial uses. Manufacturer & converter of perforated, printed-paper outerwraps, shells, element bodies for oil, fuel, air filters. End discs & caps. Manufacturer & converter of reinforced, laminated, wrapping, barrier, liner papers. UL rated, OSHA accepted, ASTME-E-84 flame spread. Manufacturer & converter of specialty paper & paperboard latex & melamine impregnated, saturated, coated, die cut, slit (wide & narrow roll specialists), sheeted. Manufacturer & converter of specialty & technical paper tissue, board, non-wovens coated, laminated, die cut, slit (wide & narrow roll specialists), sheeted, perforated, absorbent, insulating, dielectric, fish, vulcanized fibre, Mylar, wet strength, reinforced. Materials for air fresheners, electrical uses, neutral pH, anti-tarnish, heat seal, polycoated, grease & oil resistant, waterproof uses. Virgin & recycled papers. Manufacturer & converter of vulcanized fibre, fishpaper & board in different thicknesses for electrical insulation. UL, MIL, ASTM. Die cutting, adhesive laminating, slitting & sheeting. Manufacturer & converter of specialty paper & paperboard, film & foil, laminated, saturated, coated, printed, perforated, rolls, sheets. Custom die cutting, slitting (wide & narrow specialists). Adhesive laminating, pressure sensitive label stock, kiss cutting. Manufacturer & converter of industrial papers for wrapping, liner & barrier uses. Coated, reinforced, non-staining or asphaltic. UV, oil, moisture resistant, release, waxed, parchment, oilboard for filters. Manufacturer & converter of paper, board & tissue with specialized finishes, pulps, coatings & saturants to minimize lint & fibers. For industrial & technical uses. Custom die cutting, slitting (wide & narrow roll specialists), sheeting, perforating, printing. Manufacturer & converter of moisture resistant papers & boards: poly coated, latex & melamine impregnated reinforced waterproof industrial papers, non-staining & asphaltic materials. Custom die cut, slit (wide & narrow roll specialists), sheeted. Slitting: wide & narrow roll specialists. Stock specialty paper, paperboard, tissue & film. Special core sizes, large & small diameter rolls, metric & U.S. sizes, splice-free capability, hand winding, traverse & custom rewinding. Manufacturer & converter of vegetable parchment (non-writing grades) for food & industrial uses, coated, die cut, slit sheeted. Manufacturer & converter of paper & boards coated or laminated with polypropylene, acrylic, pyroxylin, & non-silicone release papers. Custom die cutting, slitting (wide & narrow roll specialists), sheeting, perforating. Manufacturer & converter of perforated, die cut, printed paper & paperboard for industrial uses, filter outerwraps & shells, element bodies, rolls & sheets with overall perforations or for tearing. Manufacturer & converter heavy non-silicone release papers in many weights, coated one side or two. Custom die cutting, slitting (wide & narrow roll specialists), traverse winding. For rubber manufacturers and fabrications. Manufacturer & converter of speciialty paper, board, tissue, non-woven & Mylar, slit (wide & narrow roll specialists), traverse wound, close tolerance, metric & U.S.. Manufacturer & converter of saturated absorbent papers. Latex, melamine & phenolic impregnated papers & paperboards. Vulcanized, dielectric & fish paper. Custom die cutting, slitting (wide & narrow roll specialists), sheeted. Capabilities include converters of cardboard, paper & paperboard, plastics & tape using slitting, high speed rotary die cutting of intricate patterns such as transmission gaskets, kiss cutting, perforating, laminating, printing, coatings, interleaving & tape converting. For use in automotive, battery manufacturing, filter, tile, specialty packaging, air freshener, candle manufacturing, paper manufacturing, die cutting & custom packaging industries applications. ISO 9001 certified manufacturer & converter of specialty & technical paper tissue, board, non-wovens coated, laminated, die cut, slit (wide & narrow roll specialists), sheeted, perforated & printed, absorbent, insulating, dielectric, fish, vulcanized fibre, Mylar, wet strength, reinforced. Materials for air fresheners, electrical uses, neutral pH, anti-tarnish, interleaving, heat seal, polycoated, grease & oil resistant, waterproof uses. Virgin & recycled papers. QS 9000 certified. ISO 9001 certified manufacturer & converter of Teslin, Tyvek, plastic saturated & latex impregnated papers. QS 9000. ISO 9001 certified manufacturer & converter of paper & boards coated with polyethylene, polypropylene, polyester, acrylic, pyroxylin, clay, wax, silicone & non-silicone release papers. Heat seal, water oil, fire resistant, reinforced papers & boards. Custom die cutting, slitting (wide & narrow roll specialists) sheeting, printing, perforating.QS 9000. ISO 9001 certified manufacturer & converter of pulp test blotter, technical papers, tissues, paperboard. QS 9000. ISO 9001 certified manufacturer & converter of paper for packing, interleaving, plain & printed, shredded. Fine & industrial tissue, plain & printed, pH neutral, sulfur-free for metals, glass & archival uses. QS 9000. ISO 9001 certified manufacturer & converter of rust inhibiting paper. Vapor proof, corrosion inhibiting pH neutral, sulfur-free paper for metals, glass & archival uses, for packing, interleaving, plain & printed, shredded. Fine & industrial tissue, plain & printed. QS 9000. ISO 9001 certified manufacturer & converter of moisture resistant papers & boards: poly coated, latex & melamine impregnated reinforced waterproof industrial papers & non-wovens, non-staining & asphaltic materials. Custom die cut, slit (wide & narrow roll specialists), sheeted. QS 9000 certified. ISO 9001 certified manufacturer & converter of specialty paper, paperboard & tissue impregnated, laminated, saturated, coated, die cut, printed, perforated, reinforced slit (wide & narrow roll specialists), sheeted, interleaving, electrical grades, neutral pH, sulphur-free, fish paper, non-wovens. QS 9000. ISO 9001 certified manufacturer & converter of manila, chip, paper & paperboard, impregnated, laminated, saturated & coated (poly, custom), fish paper & vulcanized fibre, insulating paper & board, die cut, printed, perforated, rolls, sheets. QS 9000. ISO 9001 certified manufacturer & converter of perforated, die cut, printed paper & paperboard for industrial uses, filter outerwraps & shells, element bodies, rolls & sheets with overall perforations or for tearing. QS 9000 certified. Slitting: wide & narrow roll specialists. Stock specialty paper, paperboard, tissue & film. Special core sizes, large & small diameter rolls, metric & U.S. sizes, splice-free capability, hand winding, traverse & custom rewinding. ISO 9001. ISO 9001 certified manufacturer & converter of paper, tissue, inserts, liners. QS 9000. Tape slitting & adhesive laminating, tape die cutting, kiss cutting, printing, release liners applied. Wide & narrow roll specialists, custom core sizes, large & small diameters, polyester, film, foil, paper, cloth available. ISO 9001, QS 9000 certified. ISO 9001 certified manufacturer & converter of oiled stencil board, preoiled perforator papers, specialty coatings for paper & board. Sheeting, die cutting, slitting. QS 9000 certified. ISO9001 certified manufacturer & converter of specialty papers, boards& tissues: blotting stock, filter materials, cotton blends, insheets, rolls, die cut, printed, perforated. Discs, pads, wickingmaterials, pulp test blotter, air freshener paper specialists. QS 9000certified. ISO 9001 certified manufacturer & converter of industrial papers for wrapping, liner & barrier uses. Coated, reinforced, non-staining & asphaltic. UV, oil, moisture resistant, release papers, many sizes stocked, heavy duty & lightweight. QS 9000.